Lapis lazuli, also referred to as lapis, is a stone with one of the longest traditions of being considered a gem. Deep blue in color and opaque, it was regarded as a stone fit for royalty and fetched a princely sum. It takes a prominent place in many treasures recovered from the tombs of the pharaohs of ancient Egypt. Lapis has been used to produce jewelry, carvings, mosaics, and a variety of ornamental pieces. In addition, prior to the discovery and chemical synthesis of various blue pigments, the stone was ground and processed to produce ultramarine, a pigment used in tempera paints. In architecture, the pigment has been used to clad the walls of palaces and shrines. The popularity of lapis as a gemstone continues through today. Taken as a whole, lapis lazuli means "stone of azure." The first part of the name is the Latin lapis, meaning stone. The second part, lazuli, is the genitive form of the medieval Latin lazulum, which came from Arabic (al-)lazward, which came from Persian لاژورد lāzhward. This was originally the name of a place, but it soon came to mean blue because of its association with the stone. The English word azure, the Spanish and Portuguese azul, and the Italian azzurro are cognates. Lapis lazuli usually occurs in crystalline marble as a result of contact metamorphism. The finest lapis comes from the Badakhshan area in northern Afghanistan. This source may be the world's oldest continually worked set of mines for lapis—the same mines operating today supplied lapis to the pharaohs and ancient Sumerians. Using stones from this source, the artisans of the Indus Valley Civilization made beautiful carvings and merchants traded them in distant lands. In addition to the Afghan deposits, lapis has been found in the Andes near Ovalle, Chile, where it is usually pale blue rather than deep blue. Other less important sources are the Lake Baikal region of Russia, Siberia, Angola, Burma, Pakistan, United States (California and Colorado), Canada, and India. Geologically, lapis is classified as a rock, not a mineral, because it is made up of various minerals. To be called a mineral, it would have to be composed of a single constituent. The finest color is intense blue, lightly dusted with small flecks of golden pyrite. There should be no white calcite veins, and the pyrite inclusions should be small. Stones that contain too much calcite or pyrite are not as valuable. Patches of pyrite are an important help in identifying the stone as genuine and do not detract from its value. Often, inferior stones are dyed to improve their color, but these are often a very dark blue with a noticeable gray cast. 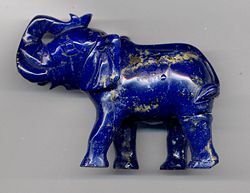 An Elephant carving in high quality lapis lazuli, showing gold-colored inclusions of pyrite. These inclusions are common in lapis and are an important help in identifying the stone. The carving is 8 centimeters (3 inches) long. 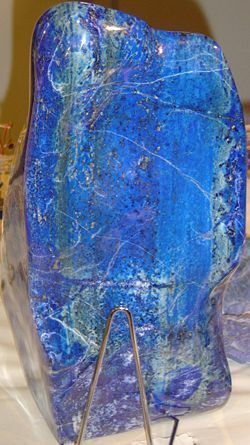 Lapis takes an excellent polish and has been made into jewelry, carvings, boxes, mosaics, ornaments, and vases. In architecture, it has been used for cladding the walls and columns of churches and palaces. It was also ground to a powder, processed to remove impurities, and lazurite was isolated to prepare the pigment ultramarine. This pigment was used for tempera paint and, more rarely, oil paint. Its usage as a pigment in oil paint nearly ended in the early nineteenth century, as a chemically identical synthetic variety, often called French ultramarine, became available. 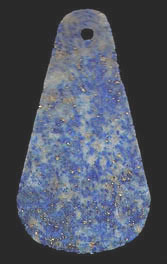 A Mesopotamian lapis lazuli pendant, circa 2900 B.C.E. The history of lapis lazuli stretches back to 7000 B.C.E. in Mehrgarh, situated in modern-day Balochistan, Pakistan. In ancient Egypt, it was a favorite stone for amulets and ornaments such as scarabs. Egyptian burial sites dating before 3000 B.C.E. contain thousands of jewelry items, many of lapis. Powdered lapis was used by Egyptian women as a cosmetic eye shadow. In addition, the Assyrians and Babylonians used it for cylinder seals. As inscribed in the 140th chapter of the Egyptian Book of the Dead, lapis lazuli, in the shape of an eye set in gold, was considered an amulet of great power. On the last day of the month, an offering was made before this symbolic eye, for it was believed that on that day, the supreme being placed such an image on his head. The ancient royal Sumerian tombs of Ur, located near the Euphrates River in lower Iraq, contained more than 6,000 beautifully executed lapis lazuli statuettes of birds, deer, and rodents, as well as dishes, beads, and cylinder seals. These carved artifacts undoubtedly came from material mined in Badakhshan, Afghanistan. The word lazuli originates from the Persian dialect of Badakhshan. It appears that ancient writers referred to lapis lazuli as sapphire. For instance, Pliny describes sapphirus as a stone sprinkled with specks of gold. A similar reference can be found in the Hebrew scriptures, in Job 28:6. Currently, the term sapphire is used for blue and other varieties of corundum. It was once believed that lapis had medicinal properties. The stone was ground down, mixed with milk, and applied as a dressing for boils and ulcers. The ancient Romans believed that lapis was a powerful aphrodisiac. In the Middle Ages, it was thought to be capable of keeping the limbs healthy and freeing the soul from error, envy, and fear. Many of the blues used in painting, from medieval illuminated manuscripts to Renaissance panels, were derived from lapis lazuli. The clear, bright blue known as ultramarine (mentioned above) was one of the few available to painters before the nineteenth century, and it cost a princely sum. As tempera painting was superseded by the advent of oil paint during the Renaissance, painters found that the brilliance of ultramarine was greatly diminished when it was ground in oil. This factor, along with its cost, led to a steady decline in usage. The use of naturally occurring lapis lazuli in paints almost ceased in the nineteenth century, with the chemical synthesis of French ultramarine and the discovery of other sources for blue pigments, such as cobalt blue. Nonetheless, several pigment companies continue to produce it, and some painters are still attracted to its brilliance and romantic history. Much of Sumerian and Akkadian poetry makes reference to lapis lazuli as a gem befitting royal splendor. For instance, this stone is repeatedly mentioned in the Epic of Gilgamesh. The Bull of Heaven's horns were said to be composed of lapis lazuli. Lapis Lazuli is a poem written by William Butler Yeats. This stone is also mentioned in Robert Browning's "The Bishop Order's His Tomb at Saint Praxed's Church." Lapis lazuli also makes an appearance in Marianne Moore's poem, "A Talisman" - which is quoted by T. S. Eliot in his "Introduction to Selected Poems [of Marianne Moore]." The stanza of Moore's poem reads: "Of lapis-lazuli,/A scarab of the sea,/With wings spread-." Eliot, in the next paragraph, raises the question: "I cannot see what a bird carved of lapis-lazuli should be doing with coral feet; but even here the cadence, the use of rhyme, and a certain authoritativeness of manner distinguish the poem." In Lorna Crozier's poem "The Memorial Wall," "a young man who'd come/ from Montana to find his brother's name,/paints the side door lapis lazuli." In Robert Heinlein's novel, "Time Enough for Love," the centuries-old main character, Lazarus Long, names one of his twin cloned daughters Lapis Lazuli. ↑ Lapis lazuli. Mindat.org. Retrieved March 21, 2007. ↑ Lazurite. Mindat.org. Retrieved March 21, 2007. ↑ Text of the poem by Yeats is available at Readprint.com. Retrieved March 21, 2007. Farndon, John. 2006. The Practical Encyclopedia of Rocks & Minerals: How to Find, Identify, Collect and Maintain the World's best Specimens, with over 1000 Photographs and Artworks. London: Lorenz Books. ISBN 9780754815419. Klein, Cornelis, and Barbara Dutrow. 2007. Manual of Mineral Science. 23rd ed. New York: John Wiley. ISBN 9780471721574. Pellant, Chris. 2002. Rocks and Minerals. Smithsonian Handbooks. New York: Dorling Kindersley. ISBN 9780789491060. Shaffer, Paul R., Herbert S. Zim, and Raymond Perlman. 2001. Rocks, Gems and Minerals. Rev. ed. New York: St. Martin's Press. ISBN 9781582381329. Haltom, Jacqueline R. Lapis Lazuli Emporia State University. This page was last modified on 21 June 2018, at 20:50.